Devil Duckie, You're the One! Nothing is sweeter or more innocent than a rubber ducky, right? Wrong. 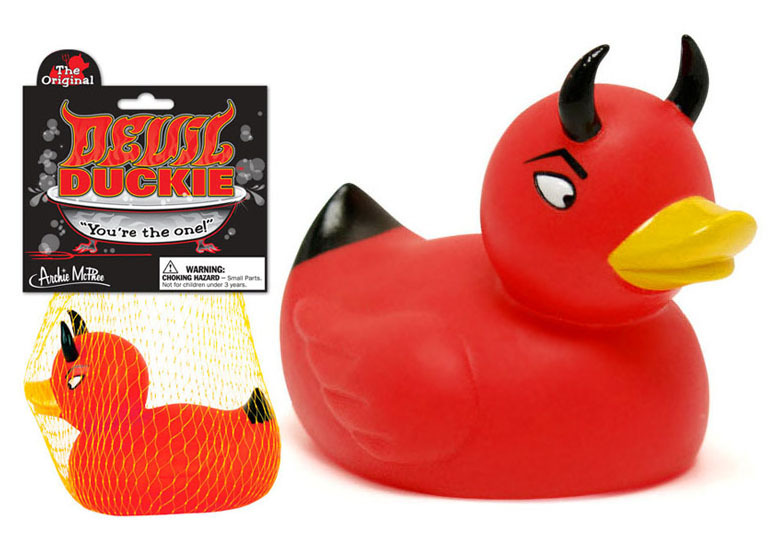 This little, 4-1/2" long, rubber Devil Duckie® is one sinful squeaker. You’ll think you’re soaking in the hot magma pools of Hades when he leers at you with his arched eyebrow in your evening bath. He may be a representative of the dark side, but it’s hard to resist his tiny horns and cute chubby red body. Net bag with illustrated header. Nothing is sweeter or more innocent than a rubber duckie, right? Wrong. This little, 4-1/2" long, rubber Devil Duckie® is one sinful squeaker. You’ll think you’re soaking in the hot magma pools of Hades when he leers at you with his arched eyebrow in your evening bath. He may be a representative of the dark side, but it’s hard to resist his tiny horns and cute chubby red body. Net bag with illustrated header.